Stitch and Slash Blocks are fun, but it seems they rarely end up the exact size they should be and in order to have a “square” quilt, all the blocks should start out the same size. There must be a very compulsive streak in me because I just can’t sew blocks together that haven’t been “squared”. All these years of stitching has caught up with me and arthritis in my hands has slowed me down a bit. Sherry has been helping me finish up some UFO’s and I pulled this set of blocks out for a Patience Corners quilt. They needed to be slashed and squared. They were made for comfort quilts for children using novelty fabrics. Here’s one of the blocks that has been slashed. It is an 8-1/2″ square of fabric cut with the AccuQuilt GO! 8-1/2″ square and 2-1/2″ strips sewn on the outside. After slashing and squaring, these blocks will be a cut size of 6″ square and will finish as 5-1/2″ square. To square up these blocks I am using the 10″ square with the AccuQuilt GO! Big Cutter, but you can also use the 8-1/2″ square with the AccuQuilt GO! Cutter. The first step is to mark the die. I use Painter’s Tape for this because it removes easily. Once upon a time, I marked my dies with Sharpie permanent markers, but soon my dies had many, many marks on them. To mark for this cut, I placed a ruler on the die and carefully placed a strip beside each edge. In the photo, you will see that there is a slight shadow on the edge of the ruler from the lamp lighting, but in reality, the tape placement is very accurate. The next step is to place the fabric on the die. After getting this process going, it was easy to place two or three squares on each corner as the inner seam allowances fell on the foam and not on the die blades and the outer seam allowances could be alternated so there was no more than four thicknesses going through the cutter. Here’s the first square placement. And here’s the second square placement. (Don’t you love the two tone foam so you can see exactly where this will cut?) As I worked, I found that it was easy just to line up the edges of the blocks with the tape on the side and not necessary to flip back the center corner to place the second square. And this is what it looks like after going through the cutter. You can see the edges that have been trimmed and the perfectly squared blocks. In this example, I cut two blocks at a time. Can’t wait to show you the finished quilt. And here’s one to show you that Sherry pieced, I quilted, and she is binding. It’s a comfort quilt for the Cancer Center. The summer weather has been beautiful, and it’s been a great time to get some UFOs finished around here. Thought I’d give you a little quilt show of what’s been done before I ship these off to their recipients. While the political season is in full swing and does not make one feel positive in the least for the future and with other very somber news, I have been listening to the Cincinnati Pops Gershwin selections with conductor Erich Kunzel from an old CD. While audiobooks are usually the media of choice for me, some upbeat music is just what is needed right now. This one was pieced by Norma and quilted by me. Sherry will bind it. Great team effort on a beautiful “Brick” quilt. This is the car quilt that I made for the AccuQuilt blog post and shows a closeup of the cars. It is going to my second youngest grandson who is 18 months old. His older brothers have lots of quilts and this will be his. There is no more fabric like this–and it will truly be missed around here. I love this fabric with the Gulf and Esso and Phillips gasoline signs as well as the Route 66 signs. Do you remember that TV show? 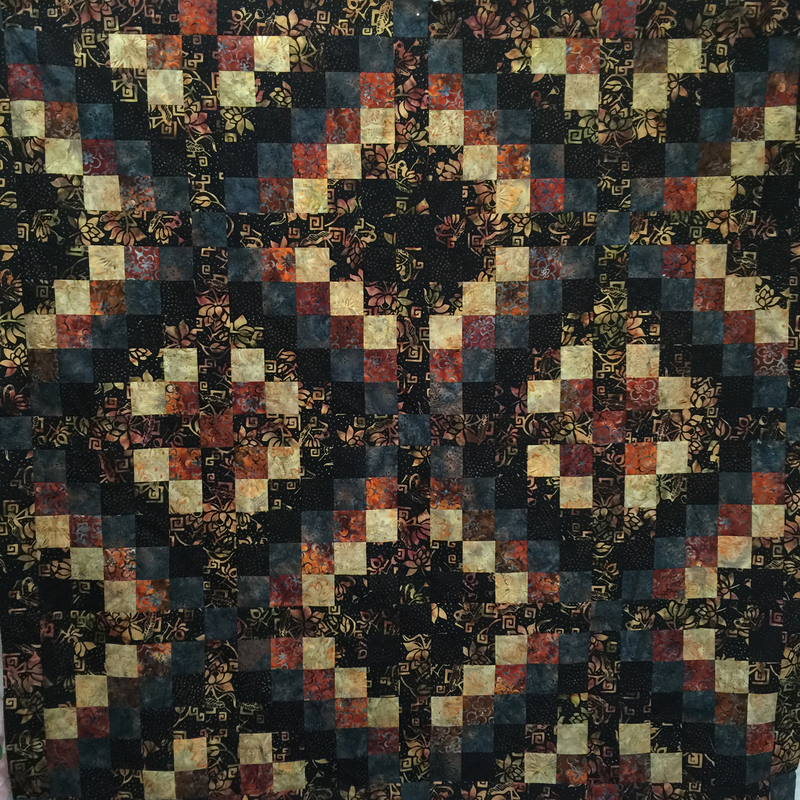 This is a quilt that I made ages ago–actually it was years ago and all those New York Star points are paper pieced using Sharon Schamber’s method. This was before I had an AccuQuilt to make the Drunkard’s Path blocks so these were cut with acrylic templates. This quilt is going to my daughter who needs a quilt to take to soccer practice and for games that won’t show red dirt stains. This has a batik backing that is black with colored checkered stripes all over it. I thought that would be perfect for a soccer quilt. And this is a Hunter’s Star made with the AccuQuilt Hunter’s Star die. This is the third one I’ve made and I still love this die and the way it turns out. It is just so easy to make these blocks–no question as to which way to press. 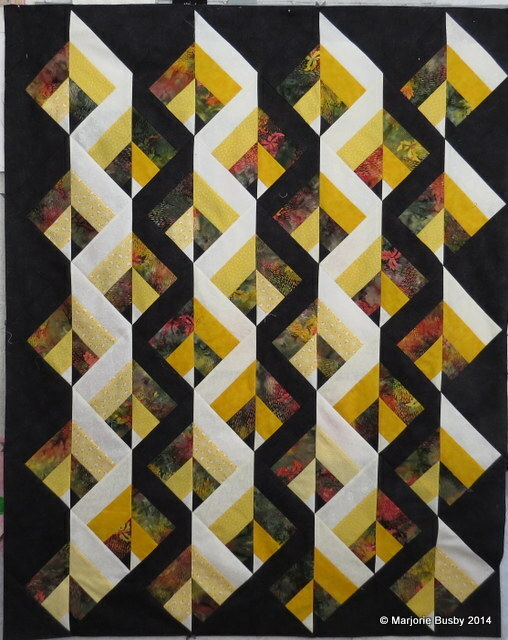 If you always press to the dark with this pattern, all the seams interlock and it makes a beautiful quilt. Four blocks make a star with a quarter star on each corner. There are a couple more quilts but I can’t show them because Sherry made them–I quilted them, and they will be gifted. I had turned off comments, but have adjusted my email, so hopefully I will see the comments when they arrive. I always hold my breath when updates, etc., are installed as my technology skills have not kept pace with all the advances. There are so many fun quilt blocks to make and never enough time. Here’s another block from Bonnie’s Quiltville Free Quilt Patterns that is so much easier using the AccuQuilt 2 1/2 inch Strip Die. Complete instructions are found on Bonnie’s website in the Scrappy Trips link of the Free Patterns tab. I used this block as a demonstration at a recent presentation and finished it in the wee hours last week just so there wouldn’t be another UFO around here. Strips can be cut from scraps or a Jelly Roll can be used. I used some half yards and a little yardage that I had on hand. The colors are dark and not my usual preference–but sometimes we use what we have. The overall look is nice though as there are some lights in the batiks that give it a little sparkle. Blocks were made with five strips stitched into a tube, then the tubes were carefully layered on the 2 1/2 inch strip die and subcut into 2 1/2 inch “tubes”. Once the long tubes were cut into 2 1/2 inch tubes, they were separated at alternating colors to create a block as shown. Blocks were separated with sashing and the cornerstones were placed to continue the colors that were in the blocks. Click on the images for a larger view and more detail. This was a fun experiment. I like the use of sashing to provide a symmetrical design. Wouldn’t it be fun to make a scrappy one without sashing? I want to share one of our favorite brick quilts. Sherry wrote these instructions, and I formatted them into a nice one page handout. One of the things I like best about this pattern is the fabric placement of the bricks. The quilt looks great as a scrappy quilt with careful placement of the solid, neutral, and print fabrics. We used 3-1/2 x 6-1/2″ bricks. Binding: 210 inches of 2-1/2” strips sewn together. Cutting: The bricks for this quilt are easily cut with the AccuQuilt GO! 6-1/2″ strip die (55086) and 3-1/2″ strip die (55032). Sew two 3 1/2 x 6 1/2 bricks together along the long side. Use one print and one solid (or reads as solid). Sew another solid/neutral to one side vertical to the seam to make a “T”. Arrange as shown in picture above, alternating the orientation of patches in every other row. Four patches across make one row. Make 9 rows.Add sashing and binding. Alternate Option using a Jelly Roll: This can also be made with 2-1/2 x 4-1/2″ bricks using one each 42 piece Jelly Roll of coordinated fabrics and fanfolding those jelly roll strips across the 4-1/2″ AccuQuilt GO! strip die (55054). This would require seven blocks across and ten blocks down for a total of 70 blocks and 210 each 2-1/2 x 4-1/2″ bricks. This is my day in the “It’s All About the Kids” blog hop, and you can read on to find out about a special giveaway by the Fat Quarter Shop and about opportunities for giving quilts to special children.Giving quilts is dear to my heart because as many of you know, our oldest granddaughter was born with a very rare and large brain tumor. She has had four delicate brain surgeries to remove parts of this tumor. Thus over the past few years we have spent weeks in the St. Joseph’s pediatric intensive care unit in Phoenix, AZ. One of the most wonderful things that happened to us during each hospitalization was receiving a quilt from the AZ Blankets 4 Kids Organization. These quilts were simply and well-made, they were colorful and bright, and they truly lifted our spirits and those of others in the ICU. Because of this, I have been working on digitizing a center block for a child’s quilt. Paper dolls are one of my favorite things and this paper doll pattern is from my mother. The design isn’t finished yet–this is my first iteration of it, but it’s good enough to go into the center of a quilt. 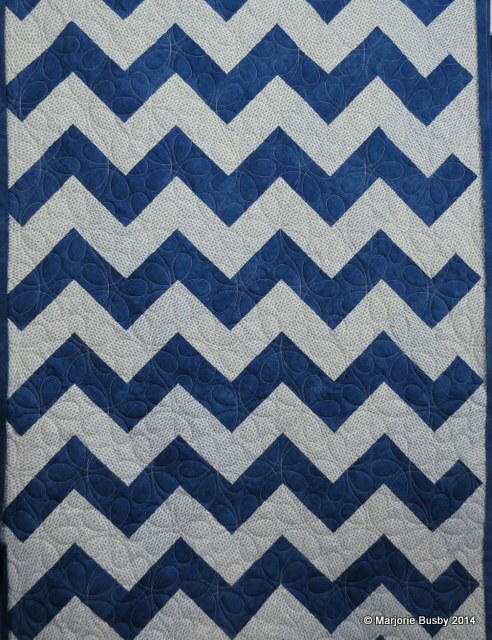 And I can border it with simple squares or flying geese or star blocks to make it just the right size for a child. This is a work in progress, but here are two possibilities of ways to use this center block for a child’s quilt. And here is an example of extra embroidery blocks used in a child’s quilt and following that, a picture of novelty fabric used in a child’s quilt. Novelty fabrics are really fun to use. And the nice thing is that you can get a single panel or a book panel print for less than $10.00. It only takes some sashing or additional borders to make it just the right size. How can you get a quilt to a special child? While I am most familiar with AZ Blankets 4 Kids, other organizations that come to mind are Project Linus and Quilts for Kids. And there are many local organizations and local hospitals who will welcome your contributions of quilts. At your local hospital, contact the Volunteer Services Department or the Director of Nursing for the Hospital. What is the best size quilt to make? In general, most organizations ask for quilts that are approximately 38-40 inches wide and 42-48 inches long for toddlers and children. However, as you read the requests from the different groups, you will see that there are also real needs for quilts for teens. A quilt for a teen should be slightly larger (lap quilt size), approximately 40-45 inches by 56-62 inches. There are also special requests for quilts for boys. As the grandmother of five grandsons, I can unequivocally state that boys love quilts. What fabric and batting should be used? Fabric: My recommendation is that you use quilt shop quality fabric because you will find that it is softer and more durable. Flannel quilts are particularly soft, but it is important to prewash the fabrics to assure all shrinkage is accounted for before cutting and stitching. If you have novelty prints or bright colors or sherbet colors, these are all very cheerful for children and teens. And for boys–dinosaurs, transportation/construction vehicles of all kinds, and Superheroes are especially welcome. Batting: A low loft cotton, cotton/poly blend, or a good quality polyester batting are all excellent choices. A high loft batting can be difficult to quilt and difficult to manage with all the tubes and equipment that are around a child in the hospital. How should a child’s quilt be quilted? Can I tie the quilt? These quilts can be quilted on the machine using a walking foot and stitching horizontally and vertically or cross- hatching the quilt. They can be quilted using your domestic machine and free-motion quilting or with a longarm machine. It is important that they be quilted with a medium all-over design so that they can be washed and cleaned. And yes, tied quilts are just fine. 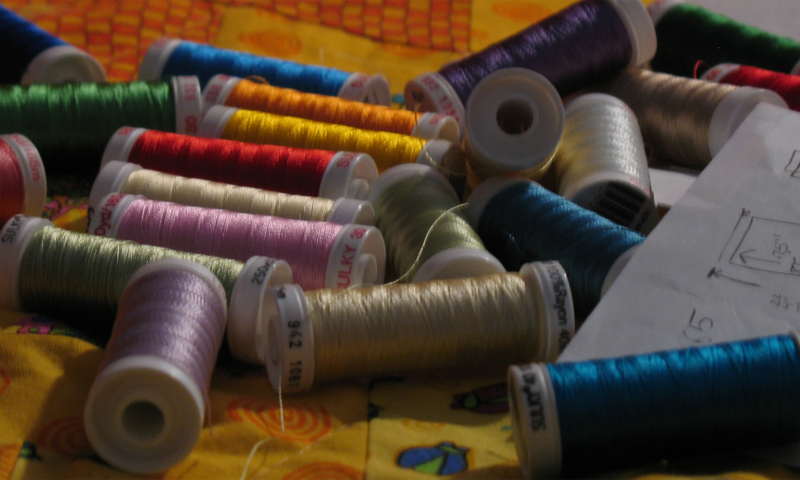 Be sure to use good embroidery floss for tying and space the ties in a 3-4 inch grid across the quilt. What are the best patterns for a child’s quilt? Each of the sites listed above share free patterns. However, as a quilter you all have favorite patterns that you love. Simple traditional patterns like rail fence, bricks, strips, and four and nine-patch blocks are favorites. Simple stars and pinwheels are also wonderful patterns for children’s quilts. And another quick and easy quilt to make is to use orphan blocks. Do you have extra blocks leftover from other quilts you have made? Why not put them together with sashing and borders to create a sampler quilt? And there are many free patterns in the links on this blog that can be modified in size and fabric to make quilts for children. One of my favorite books for children’s quilts is the Tuck Me In book from the Editors and Contributors of Quiltmaker Magazine. What are your favorite children’s quilt books? And recently SewCalGal wrote a review of the Nap and Nod children’s quilts book. Should I wash the quilt before donating it? I like to wash quilts for children before I send them. I think it is a personal preference, but somehow it makes me feel better to know that the quilt is nice and clean and the fabric and batting are “softer” because of washing. And we would like to thank The Fat Quarter Shop for sponsoring a $25.00 gift certificate giveaway. All you have to do is leave a comment on this post before Sunday, November 2 to be entered into this giveaway. The winner will be announced on Tuesday, November 3. Does it seem that blogging is on the back burner? I think about it every day, but seems that life is just as hectic as it was before I retired. We fill the spaces. There are six grandchildren now and another one on the way. While only three of them live nearby, they all have a pretty high priority on my to do list. Yesterday 2 year old BO played with the buttons on the front of the dishwasher–they all light up when you push them–and the dishwasher no longer works. We called tech support, and they couldn’t help, so it means waiting until a repairman can come to fix it. Fortunately, it’s still under warranty, so there will be no cost. The question is: was it the combination of buttons he pushed, or would it have happened anyway? Who knows, but children sure do keep us on our toes. Once the dishwasher is repaired, we will use the child lock button for sure. However, it only makes one wonder how long it will take him to figure out how to disable that. And why is the dishwasher situation significant to quilting? Well, since hubby does all the dishes, it means I’ll be helping with the dishwashing until it’s fixed. But quilting has occurred (not in the past two weeks) but in the weeks before that, so here are some snapshots of things that have been finished. This first quilt is just lovely. The customer did not want to pay for custom, and I wasn’t willing to do custom for free, so I did an edge to edge of one of my own designs. This is called Tilt A Whirl and is one of my all-time favorites. I can’t think of a prettier edge to edge for a quilt with large open spaces. And this quilt is one that Norma sent me to quilt. I absolutely love the colors on this one. And these three are quilts that I sent to AZ Blankets 4 Kids. As I’ve mentioned before, they provided quilts for us when Ezri had her surgeries in Phoenix at Barrow Neurological Institute / St. Joseph’s Hospital, and this is my way of giving back. Sherry pieced the butterfly quilts and Norma pieced three Teddy Bear quilts (only one is pictured). They’re all beautiful. The photos of these last three don’t have enough light to show the beautiful bright colors as well as the real thing. They are so beautiful and will be loved I’m sure. It seems 2014 keeps us unbelievably busy with grandchildren and family. Last weekend, all that was put aside for some time doing nothing but stitching on the machine. The quilt retreat in January made me realize how much I enjoy just sitting at the machine stitching. I spent all of Saturday piecing quilts. This is one of the finishes from last Saturday. It is the quilt for my daughter’s friend’s mother who is undergoing chemotherapy for breast cancer. The pattern is the Warm Wishes free pattern from Quiltmaker magazine. It is often used in the crib size for project Linus quilts. It is simply a six inch rail fence block alternated with a focus fabric block. It can be pieced in long strips –easy to cut, easy to stitch. 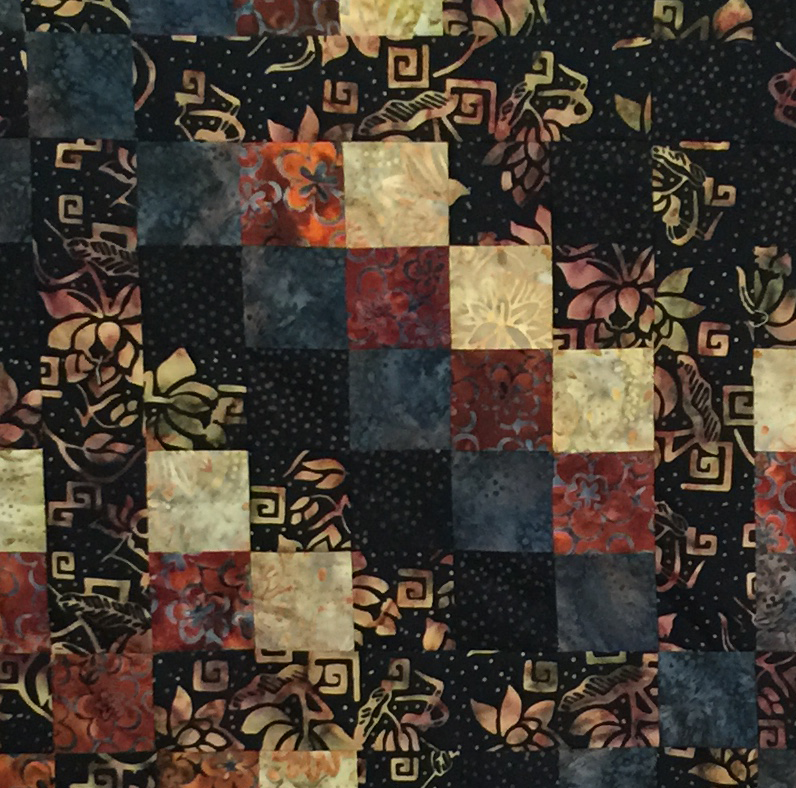 With different color placements and widths for the rails, the quilt has many variations. In the sunlight, the pinks on the two focus fabrics I used looked the same, but under the CFL light, the pinks are not the same. And one of my goals for the 2014 is to make more quilts for an organization that befriended us each of the four times that Ezri had her brain surgeries. The organization is AZ Blankets 4 Kids. I will never forget the first night we were in the PICU with that tiny little girl with tubes and wires everywhere, and someone brought in a beautiful red and white lap quilt. That was the softest and most comfortable quilt and truly was a comfort quilt for that night and many nights thereafter in the hospital. And the next morning as we walked through the PICU, there were bright, beautiful quilts on every bed. Yesterday, I sent this quilt to Arizona. It is leftover zoo animals novelty fabric. It was a piece and quilt as you go on the longarm. I loaded the backing and batting and stitched fabric strips and flipped them and stitched the next strip. Last weekend at Quilt Retreat Sherry and I were experimenting with Bonnie Hunter’s Strip Twist to see if we could make a quilt that she envisioned making for her son. Somehow we couldn’t get the pieces for the blocks we wanted without making a second block (and in the end a second quilt). But Monday morning, I decided to take the holiday to give it another spin. Using strips from the 2-1/2″ strip bin, this is the result. It is the Strip Twist pattern from Bonnie with the colors going from dark to light in the strip sets. When the strip sets are joined, it creates a block that goes from dark to light on one side and light to dark on the other side. When set into an on point layout, it creates this great design. At quilt retreat, I almost finished this one (which is the double rail fence with 3-1/2 x 6-1/2 inch rectangles) and continued to work on it at home. It went onto the longarm on Sunday and was quilted. The binding was stitched on with the quilting machine, so I am going to finish the binding–maybe by hand while watching movies in the evening. Here are some pics from quilt retreat. We had a great time. This is yesterday’s project. It was complicated only by the fact that the backing was only one inch larger all the way around than the top. After talking with the client, we decided to trim 1-1/2″ of the border all the way around. The border was originally just over 6 inches, so this left plenty of border on the quilt, and it gave me enough room to do the quilting. The pantograph is Sumptuous by Hermione Agee. This is the second time I’ve used it, and this time I reduced the size to 5 inches. The original size is 14 inches which is much too open to suit me. What is really funny is that my husband came in while I was quilting and said, “I thought that was your quilt”. He was remembering a blue and white quilt I made several years ago for my Mother that used exactly the same prints. And here’s the hat. Last year I was knitting lots of hats and this is the one that I made for Owen. He wore it a lot. Then his Mom washed it in the machine, and the blue yarn was felted–that’s what happens when you use scraps. Besides being smaller, the hat also lost it’s stretch. I cut out the felted top and re-knitted a new top. He still wouldn’t wear it. So, I went to the yarn store (spent $30-ouch!) and got new almost matching yarn and knitted a new one. Now he likes the old one better. What can I say? Sherry sent me photos of a quilt she finished for Shirley, one of the members of our Slap Happy Quilters’ guild. Below are instructions for making this quilt as well as a photo of the members of the SHQ holding the quilt at the Christmas gathering. Shirley was not well enough to attend–and our prayers go out to her and her family. As you can see from the quilt, she has a beautiful sense of style and quilting. Finished Size: 39 x 61 inches. Medium fabric: Cut 55 bricks 3 1/2” x 6 1/2”. If you are using yardage, cut 5 strips 6-1/2” across the width of fabric (WOF). Rotary Cutting: Layer 6-1/2” strips and cut across them at 3-1/2” to get 55 bricks. Accuquilt Cutting: Fanfold 6-1/2” strips across the 3-1/2” die and cut. Light fabric: Cut 55 bricks 3-1/2” x 3”. If you are using yardage, cut 5 strips 3” across the WOF. Rotary Cutting: Layer 3” strips and cut across them at 3-1/2” to get 55 pieces. Accuquilt Cutting: Fanfold 3” strips across the 3-1/2” die and cut. Sashing and borders: Cut 380 inches 3-1/2” wide. These strips can be cut across the width of fabric or on the lengthwise grain. Join these strips with a 45 degree angle seam by placing ends of strips at a right angle and stitching corner to corner. Assembly: Sew light to medium as shown. Arrange 11 patches as shown and sew into a row. Make 5 rows. Place sashing in between rows and add borders. If you cut your sashing strips across the width of fabric remember that there is some ‘stretch’ associated with the grain across the width and lay the sashing strips flat across the rows and pin before stitching.